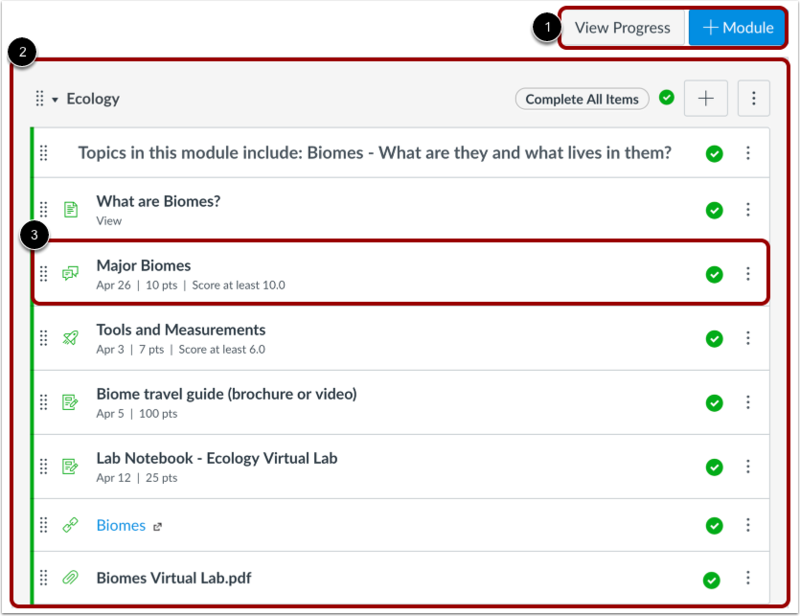 Modules control the entire flow of your course and its content. As an instructor, you can add modules, add items to a module, and manage module settings. You can also reorder all modules and module items. The Modules Index Page is designed with global settings at the top of the page  followed by individual modules . 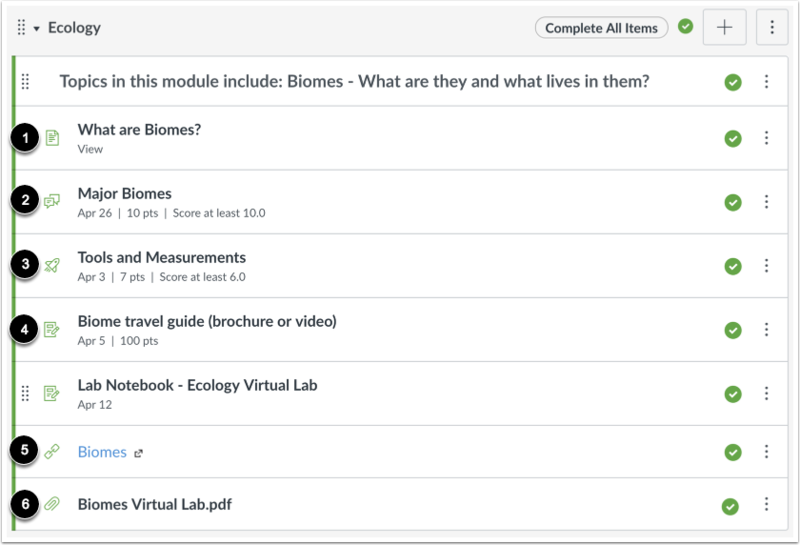 Course content items are nested within each module . Global settings include viewing a student’s progress in a module and adding new modules. 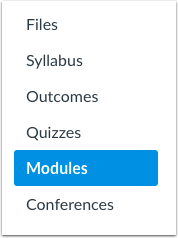 In Modules, you can view all the modules in your course. Modules are organized by order of progression. Modules house the content items within each module. By default, modules are expanded and show all items in the module . To collapse the module, click the collapse arrow . Each module header contains the name of the module . The header may also contain module prerequisites  and module requirements . The icons on the right side of the module name control the entire module. You can publish or unpublish an entire module  and add a new content item to the module . In the Options drop-down menu , you can edit a module , which allows you to rename the module, lock modules, set prerequisites, and set modules requirements. You can also move the module , move module items , delete the module , or duplicate the module . You can reorder a module by hovering over the drag handle next to the name of the module and dragging the module to the desired location. Each module contains module content items that may display the item name , the due date , the number of points , the module requirement , and the module item's draft state status . A module may also include non-graded items , such as pages and non-graded discussions. If a To-Do date was added to a non-graded item, the date will display next to the module item . 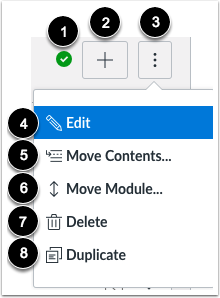 For each individual module content item, you can use the options drop-down menu  to indent the item up to 5 levels (or remove an indent) , edit the content item , duplicate the item if the item supports duplication , move the item , or remove the content item from the module . You can also reorder a module item by hovering over the drag handle next to the name of the item and dragging the item to the desired location. 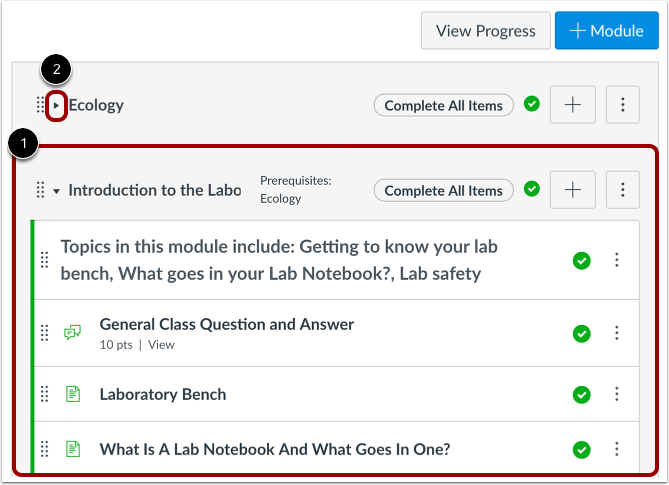 If you use MasteryPaths in your course, you can view the Modules page and tell which module items are set up for MasteryPaths. If your course includes Blueprint icons, your course is associated with a blueprint course. Blueprint Courses are courses managed as a template and may contain locked objects managed by a Canvas admin, course designer, or other instructor. Like with draft state icons, Modules displays the object status as also shown in the object's respective index page. Previous Topic:How do I view content and student activity within a group as an instructor? Next Topic:How do I use Draft State in Modules? Table of Contents > Modules > How do I use the Modules Index Page?